The WL 50 offers high payloads to provide better breakout force and lifting capacities. 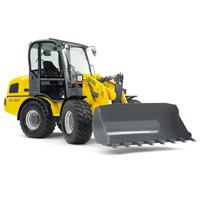 Its ergonomic design enhances operator comfort and improves productivity. Operating elements, including a multifunctional single lever control and an additional lever for third control circuit, are conveniently arranged next to the driver’s seat for easy operation. Driver’s cab features excellent visibility and an infinitely adjustable steering column. The driver’s platform is side tilting for easy access and serviceability. 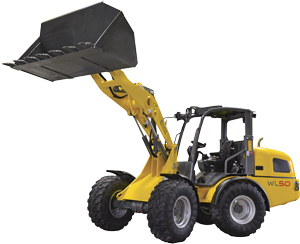 This unit features a hydraulically operated centrally-articulated pendulum steering system. The WL 50 provides a tight turning radius for added maneuverability in small areas.